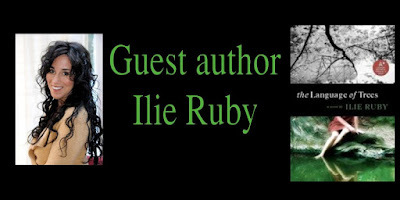 Please welcome today's guest author Ilie Ruby! 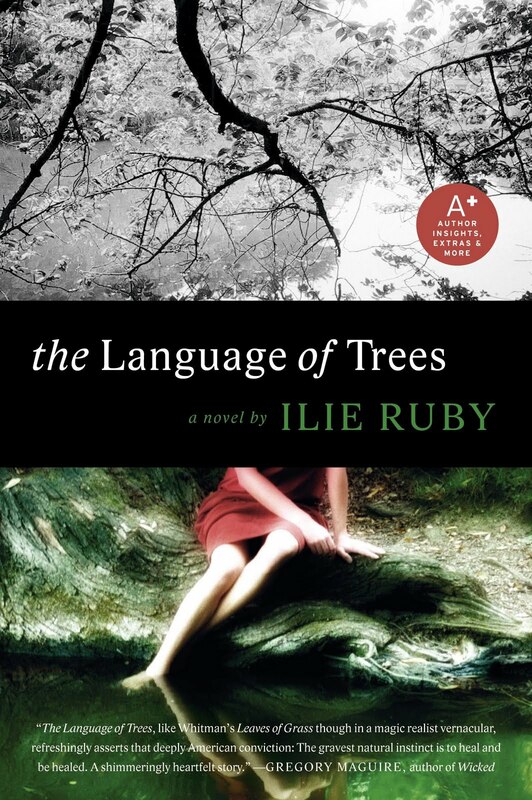 Ilie is the author of The Language of Trees . Ilie: I began writing when I was old enough to hold a pen, probably about 3. I asked for my first typewriter when I was 6. I actually wrote a letter to the tooth fairy in which I was gunning for enough money to buy a typewriter in exchange for one of my front teeth. It seemed like a fair trade to me. I keep a locked box in my office—ok, its a sort of vault that holds one particular story I wrote. I started the story when I was in the 2nd grade, and I worked on it, on and off, for the next 10 years, until I was a senior in high school. I don’t think I’ll ever throw away those pages. They are testament to a lifelong passion and an unwillingness to give up. Ilie: I have always been interested in the way folklore, myth, and paranormal childhood experiences converge with childhood memory. In other words, how we understand the experiences we had as children and what meaning we give those experiences as adults. My mother demonstrated psychic abilities when I was growing up and would often appear at the moment I needed her, even if I was halfway across town and had just fallen out of tree and broken my arm. She would suddenly pull up in her green station wagon, explaining rather matter-of-factly that she had a feeling something had happened to me. This “feeling” about things led her on some heroic journeys when it came to other relatives. To my sister and I this was a normal part of life. We’ve tossed around the idea that this ability might be inherited, but I think it’s best not to focus on it. I think most people are psychic to a certain extent. And I have a raging optimism about the existence of a spiritual realm. When I wrote my book, THE LANGUAGE OF TREES I drew from experiences I had in many of the cabins my family rented. Several were said to be haunted. This just made them all the more interesting to me. I like what author Isabel Allende has to say about all this. I’m paraphrasing here, but according to Allende, if you are aware of the extraordinary in the every day—the mysteries, the chance occurrences, the synchronicities, the coincidences that can’t be explained, and the power of nature and faith—when you have this sort of view, it comes out naturally in your writing. That is true for me. Ilie: Supernatural talent? To heal my own body of any illness. That would be my first wish. Then my wish would be to heal others. This is a talent that Grant, my protagonist, has, although he has not made peace with it yet. It is a tricky thing, having a talent with the potential for so much good. It’s a big responsibility. For some it might be a blessing, for others, a burden. Ilie: I hope readers like my book. I’m not particular about the reasons why. I think a large population of people will relate to the struggles and life experiences my characters have had, and their journeys of love, loss, and love again. The book is a constellation of love stories woven with magical realism and Native American folklore. And there is a mystery that I guarantee will surprise you in the end. It was very important to me to render relatable characters—real people who have made very real mistakes: they have chosen fear over love, they have run away, they have made bad choices, and they have given up. Sometimes they have hurt themselves. And yet, they are valiant in their determination to heal. If my book has one message it is that there are second chances, even after you’ve suffered the greatest tragedy of your life. Even in your darkest hour, there is life after life. Ilie: If my book THE LANGUAGE OF TREES were a movie, Brie Larson, who plays Kate Gregson on The United States of Tara, would play the once-teenage addict, Melanie Ellis. She’s edgy without being unlikable. Very low-key, and can hit a dead-pan note just perfectly while still being adorable. I think she’s got amazing range. Grant Shongo, the reluctant Seneca healer, could be played by Eric Bana from The Time Travelers Wife. Humble, he looks like he’s got deep waters, and that he cares. Echo O’Connell, who broke Grant’s heart years ago, the free spirit who never grew up, could be played by Emily Blunt, someone completely natural, honest and vulnerable. Leila Ellis, the mother of three, whose children have suffered for her mistakes, needs to be played by someone tough, flawed, but sympathetic so I choose Jessica Lange. And finally, Joseph O’Connell, the wisdom-keeper of the story, who maintains his belief in the power of the human spirit when he is given every reason not to—he needs to be played by someone grand enough to hold all of the human tribulations in the story. It’s not easy to hold this sort of belief system. I choose the capable hands of Robin Williams, if he were just a few years older. 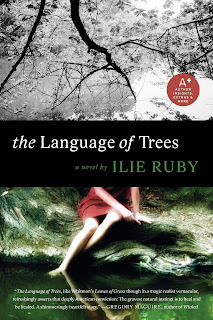 The Language of Trees by Ilie Ruby. Echo O'Connell knows that the summer holds its secrets. They are whispered in the rustling trees, in the lush scent of the lilacs, in the flurry of the mayflies batting against the screen door, and in the restless spirits that seem to clamor in the scant breezes on hot evenings. It is in summer that she returns home to Canandaigua, to confront these spirits, both living and not, and to share a secret with her first love, Grant Shongo—a secret that will forever change the lives of many people in the town and put to rest the mysterious disappearance of a little boy more than a decade earlier. Grant, a descendant of the Seneca Indians who call this place "The Chosen Spot," has also come back to face his past. After a broken marriage, he has moved into his childhood home, a lake house that has withstood happiness and tragedy. He knows the spirits of the past must be dealt with—that of the little boy who disappeared all those years ago; the boy's sister, who never overcame the loss; and the love Grant still has for Echo. But before the healing must come the forgiveness. . . . Thank you Ilie for joining us here today at From the Shadows! 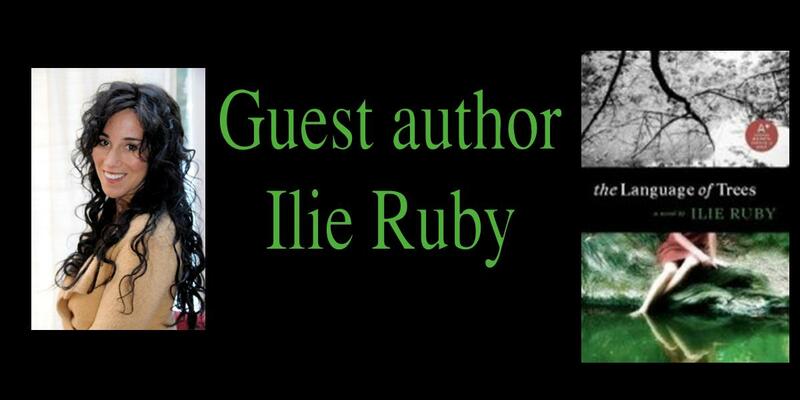 To learn more about Ilie Ruby and her book The Language of Trees please visit her website. To read my review of The Language of Trees go to my review.